Date of Birth: July 24. 1930. Bingen Community, Hempstead County, Ark., at the home of his grandparents, Mr. and Mrs. W.H. Harris. Date of Death: Jan. 13, 2019. Place of Death: His own home in Bingen, only a few hundred yards from the place of his birth. Member of the First Baptist Church of Nashville, Ark. Retired truck driver and dispatcher. Army veteran – served in the Korean Conflict on front lines. Billy Neal grew up in the outdoors, was a worker on the family farm, and enjoyed hunting, fishing, and camping. He had a lifelong love of automobiles. He was a loving husband, father, grandfather, and great-grandfather. Friends and grandchildren called him “Toofer,” a nickname since his high school days. He was preceded in death by his parents, Thomas and Verna Jones, and his wife of 63 years, Linda Clingan Jones. He is survived a son, Bill Tom Jones and wife Debbie of Conway, Ark. ; a daughter, Julie N. Jones of Frisco, Texas; two grandsons, Tadd McCullough and spouse, Blake Harris of Dallas, Texas; Stuart Jones of Conway, Ark. ; great-granddaughters Macy Rose Jones, Leila K’lee Kim, and great-grandson Noah Kai Jones. He lived a good life, filled with love for family. He is also survived by many friends who knew him, loved him, and will remember him. 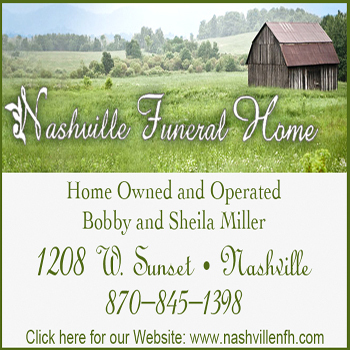 Graveside services will be Wednesday, Jan. 16, 2019 at 2 p.m. in Bingen-Ozan Cemetery in Bingen under the direction of Nashville Funeral Home. The family will receive friends at the funeral home from 12 until 1 p.m. on Wednesday. You may send the family a sympathy message to Nashville Funeral Home on Facebook.